Everything is changing . . . Turning sixteen can be hell, especially if everyone in town thinks your mother killed herself and your sister. All Kira Callahan wants to do is swim, hang out with her best friend, Sean, and ignore the kids who torment her at school. That is, until one day when she gets invited to a party. For three minutes her life is wonderful—she even kisses Sean. Then somebody spikes her drink and some girls from out of town lure her into the ocean and hold her underwater. Kira soon discovers that the group of wild teenagers who have come to visit Crescent Moon Bay are not as innocent as they seem. In fact, nothing is as it seems—not the mysterious deaths of her sister or her mother, not her heritage, not even her best friend. And everything seems to hinge on the ancient Celtic legends that her mother used to tell her as a child. Renee here, I don't usually post a lot about young adult fiction or paranormal fiction but I love it and probably read just as much in those genres of fiction as I do Christian or historical fiction. Merrie Destefano is one of my favorite writers of adult paranormal/urban fantasy fiction. 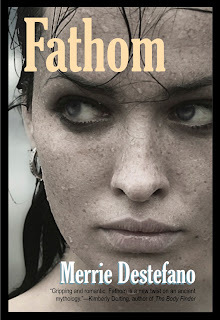 With her latest release, Fathom, she's written a paranormal tale starring a teen heroine and so far I'm hooked! For Halloween Merrie has typed up a special post about her love of edge-of-your-seat tales and a bit about Fathom. Grab that Halloween candy, sit back and enjoy! Stay tuned to this blog for my review of Fathom later today! For now, here's Merrie! In the wake of a failed attempt to defeat the vampire Richelieu, Susan and her friends are weakened and divided. Raphael must set aside his animosity and join with his enigmatic sire Gabriel to discover a powerful weapon before Richelieu claims it. Meanwhile, Susan and her cousin Wendy translate a 12th century diary belonging to their ancestor, Carissa, to learn the origin of their family's connection with the vampires. As Carissa's story of love and betrayal unfolds, they discover the secrets of the present will only be revealed by solving the mysteries of the past. Clash of the Titles: Living in Harmony, New Amish Fiction! The Clash of the Titles Blog Alliance is proud to share great August release with its readers. Ink still damp from the presses, Living in Harmony by Mary Ellis, currently sits on a store shelf near you! Want more good news? It’s the first in a series—perfect time to jump on board. Living in Harmony is the first book in bestselling author Mary Ellis's New Beginnings series. It's about fresh starts and love...and how faith in God and His perfect plan for our lives provides us with the peace and joy we desire. Amy King--young, engaged, and Amish--faces difficult challenges in her life when she suddenly loses both of her parents in a house fire. Her fiancé, John Detweiler, persuades her and her sister Nora to leave Lancaster County and make a new beginning with him in Harmony, Maine, where he has relatives who can help the women in their time of need. Winner of Twice Promised by Maggie Brendan + Swag! Marissa has been notified that she won and has already claimed her prize! Thank you all again for participating and remember if you'd still like to read the book you can order it online at almost any store! One Woman. Two Men. One stirs her pulse and the other her faith. But who will win her heart? Marceline Murphy is a gentle beauty with a well-founded aversion to rogues. But when two of Boston's most notorious pursue her, she encounters a tug-of-war of the heart she isn’t expecting. Sam O’Rourke is the childhood hero she’s pined for, the brother of her best friend and a member of the large, boisterous family to which she longs to be a part. So when his best friend Patrick O’Connor joins in pursuit of her affections, the choice seems all too clear. Sam is from a family of faith and Patrick is not, two rogues whose wild ways clash head-on with Marcy’s—both in her faith and in her heart. Can a marriage of convenience ever become one of true love? Ingrid Larsen arrives in Michigan in 1871 with little more than the clothes on her back and a determination to find her brother, who has disappeared into the dangerous lumber camps. Destitute and barely hanging on to hope, the young Swedish immigrant crosses paths with Joshua Hunter, a newly widowed farmer with eyes the color of the ocean she had crossed and five rambunctious children to raise on his own. Marriage would solve both of their problems, and Ingrid finds herself proposing in broken English to a man she barely knows. Many difficulties lie ahead--but the hardest battle of all will be winning the heart of her new husband. A young woman traveling the Oregon Trail in 1842 must rely on a stranger to bring her to safety. But whom can she trust with her heart? Two beautiful brides. One unsuspecting groom. Three weeks to figure it all out. Greta Olsen arrives in Central City, Colorado, as a mail-order bride, expecting to marry Jess Gifford, the man she's come to know through his tender letters. But when she meets Cora Johnson, she discovers she's not the only bride waiting at the train station for Jess. Already shocked to find they must compete for Jess's affection, the young women can hardly believe it when not Jess but his brother Zach picks them up from the station--and reveals that Jess knows nothing about any mail-order bride, let alone two. Will either bride make the match she hopes for? Filled with surprises, misunderstandings, and tender romance, Twice Promised is the story of how two unlikely women become twice blessed. Winner of COTT's August New Release Clash! I Met Some Famous People!